Leeds Rhinos have appointed South Sydney Rabbitohs assistant coach David Furner as their new head coach on a three-year contract. Furner, 47, made 47 appearances as a forward for Rhinos, winning the Super League Grand Final in 2004. 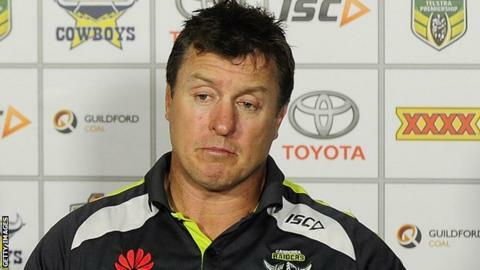 The Australian started his coaching career with Canberra Raiders, serving as head coach from 2009 to 2013. Leeds had been without a head coach since Brian McDermott was sacked in July after eight seasons with the club. "To finally have this in place now is brilliant news for everybody," Rhinos director of rugby Kevin Sinfield told BBC Radio Leeds. "What made this so attractive was the influence he had back here all those years ago. "He played a huge part in certainly helping my development, but also the group of young players and the senior lads as well. "It's pretty clear we need a bit of a rebuild here and there's no better bloke that I'd want alongside me to help me do it." Leeds, who have been led by Sinfield and first-team coach James Lowes since McDermott's dismissal, are second in the Qualifiers after three games. A top-three finish after seven matches will guarantee a Super League place next season for Leeds, who were champions in 2017.